Overall the market is still moving in a direction favorable to buyers, but more slowly than it was late last year. By March of this year inventory is already at levels that it didn’t hit until May or June last year. Meanwhile, sales are still down from a year earlier. Foreclosures are still not really an issue at all right now. 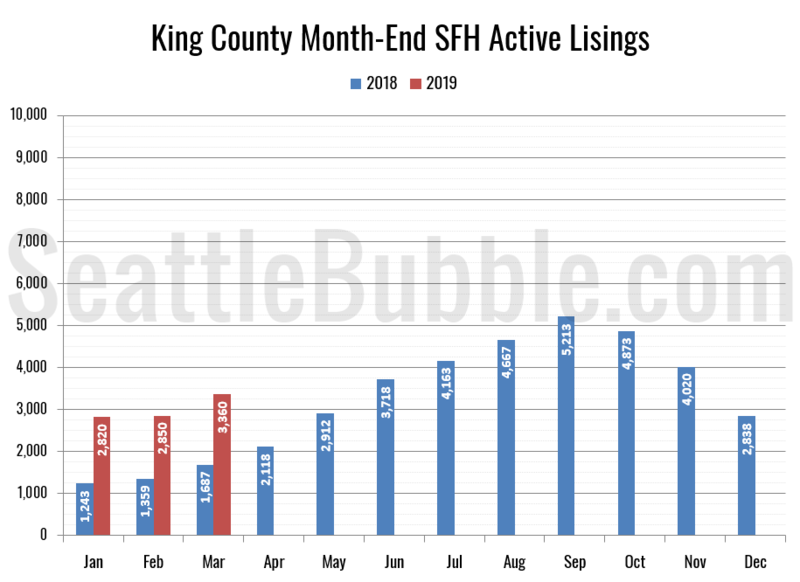 The number of homes on the market in King County climbed 18 percent from February to March, and year-over-year listings are up 99 percent from March 2018. 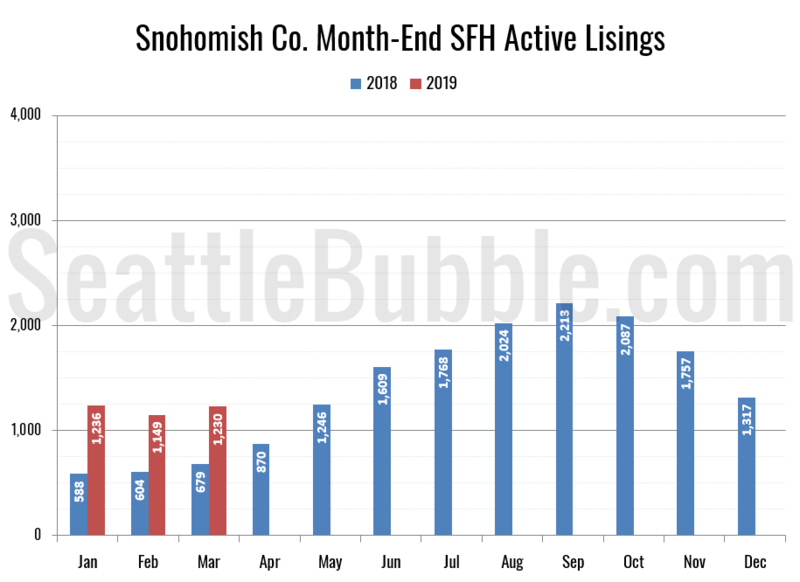 In Snohomish County inventory rose 7 percent month-over-month, and the year-over-year growth was up 81 percent. 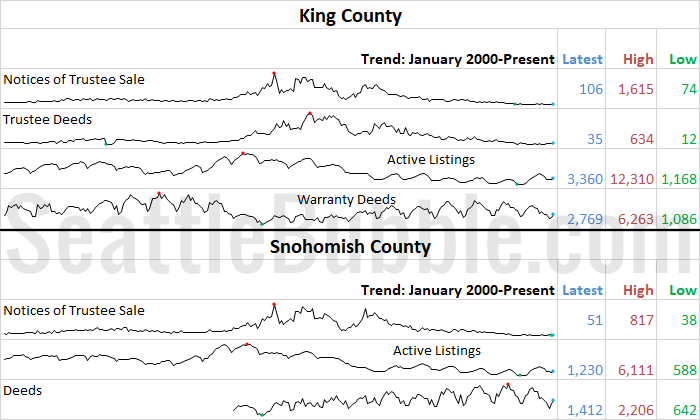 Both counties were seeing much larger year-over-year increases in inventory in December and January. 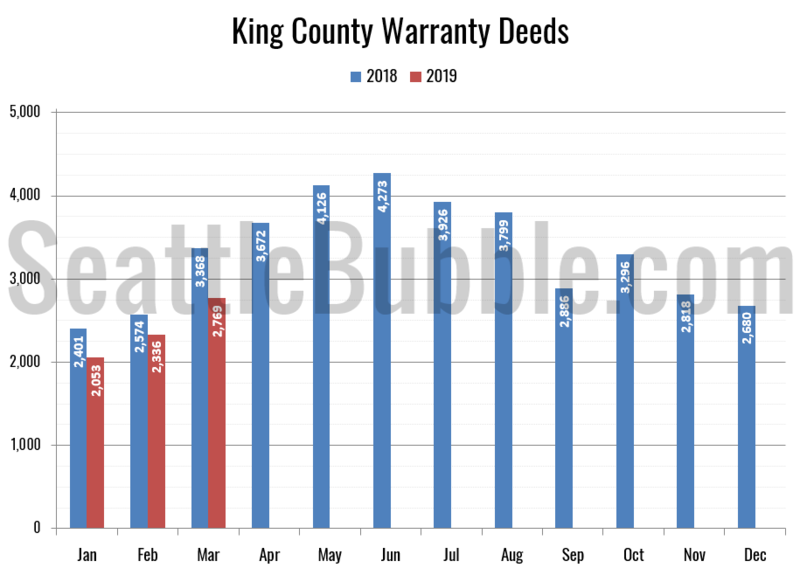 Sales in King County rose 19 percent between February and March (a year ago they rose 31 percent over the same period), and were down 18 percent year-over-year. Keep in mind that sales that closed in March mostly went pending in February, which is when we had the giant snow storm. So it’s not surprising to see weak closed sales for March. 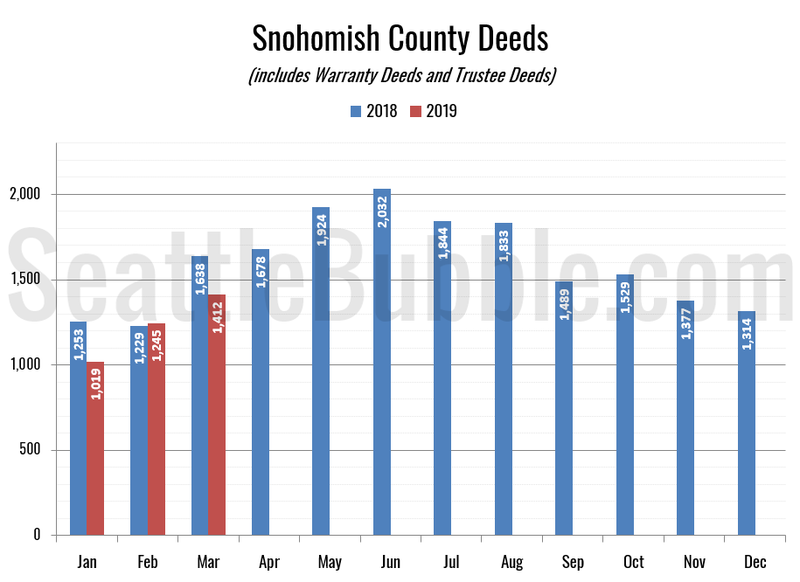 Deeds in Snohomish rose 13 percent month-over-month (in the same period last year they were up 33 percent) and were down 14 percent from a year earlier. 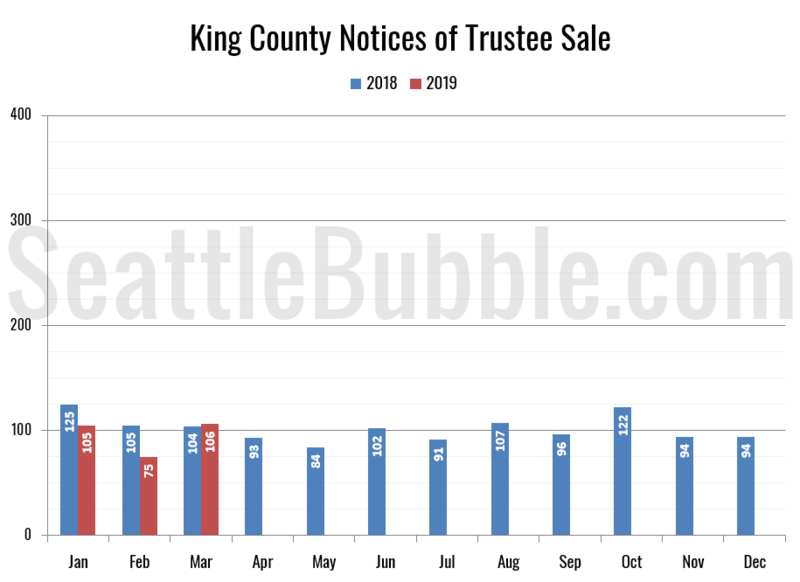 Foreclosure notices in King County were up two percent from a year ago and Snohomish County foreclosure notices were up 14 percent from last year. Since the numbers are so low, recent changes can appear large in percentage terms, but we’re talking about changes of just a few dozen month to month and compared to the prior year. 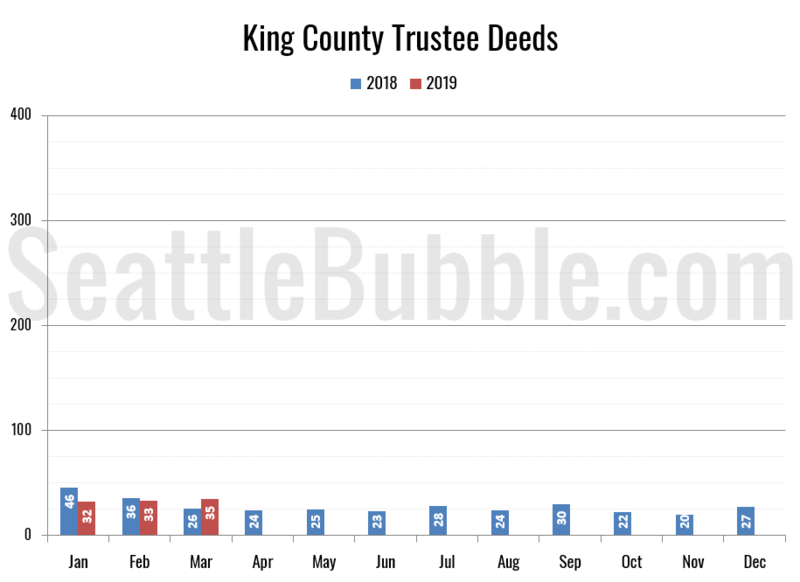 Trustee Deeds were up 35 percent from a year ago. Check out the robust Seattle area economy for record setting homelessness [especially veterans]…especially search the wooded wild fire areas in the “West Coastal Areas” they disappear into….homelessness with toxic outdoor wild fires is morphing into a way to survive and work in Seattle? But clean “smokeless” air and OVERPOPULATION sewage dumping into Puget Sound is FAR less important than obeying our Chinese NWO Overlords….Hades, Covington/Kent woods are full of them hiding….we’re doomed. Chinese spies attacking the Trump with Malware, U of W bringing in Chinese students with phony admissions transcripts you can’t vet, etc, etc…. MSFT needs more unlimited chain migration into Seattle to make it FAR worse. Boeing eliminated pensions for green engineers [meaning the retired Boeing engineers need burger flipping jobs to survive as their Boeing pensions disappear] and outsourced all the part drawings to Japan in Japanese so the FAA engineers can’t audit them now…the immigration attorneys mucked Seattle up. i know FS likes to exaggerate to make a point, but he can be right from time to time. i was paid about $120k to live in seattle from 2006 to 2018. Tim, thanks for posting this. I am sure that somebody (who only speaks for himself anyway) will try to spin this as being proof-positive that the Buyer’s Strike (ticker symbol “BS!”) is working, spreading and growing HUGE. In 2015, these kinds of low inventory figures were making people panic. Go back and check the old SB postings if you don’t believe it. Now, this is just the new normal. The real estate agents I know who work both sides of the street (buying and selling) feel like they can breathe again. There is enough inventory for them to have something to show their buyers. There is enough inventory to keep their sellers from being unrealistic and greedy. Although conditions still favor sellers at this point, this is what you call a normal market. Dariakus, how would it look if you ran the same numbers? We are interested in finding a home with a MIL unit we can rent out. Which brings up the question about legal/illegal and non-conforming. Seems many properties have non conforming bedrooms that people have used as rentals without going the legal route. Would you buy one of these if your intention was 100% to rent out the unit? Would you add conforming windows, get permitted or just keep quiet and hope the city wasn’t tipped off. Seems like at least adding conforming windows for safety reasons would be wise. Declining sales, rising inventory, and declining prices (YoY), no doubt. That is the New Normal… and ba-da-ba-ba-ba, I am loving it! Not sure. There’s not much to run that I haven’t run before. This article just reinforces what I’ve always thought about these articles: it ignores everything else other than owning a house. I have five children with multiple extracurricular activities, and I’m saving for college and maxing our a 401k. I can’t hit a 20% down payment because the house value has shot up far faster than I could save for one. I could touch my 401k for that, but seems like a bad idea. I can always find somewhere to live—I can never get a loan for retirement. If I wanted to just put 10% or down and pay over a grand more per month right now, I’d end up having to cut a lot out of my life and I’d more than double my commute. If I wanted to stay within the same distance of my kids school, my work, and assorted activities were talking a 2k increase in monthly payment to own. Financially, would it be worth it in 10 years when I retire? Maybe, assuming I wanted to sell. But I’ve got everything else covered, retirement and college and whatnot, a landlord who is more than happy to let us keep renting with only marginal increases every year, and so no reason to flip it all on its head at current real estate prices just to claim I own something. i guess this is the next step for perma-renters. right to sleep on sh*t-filled sidewalks. I used to be a fan of financial samurai but lately find him out of touch with the ordinary individual, such as by suggesting that everyone should be saving $58K per year in their 401K. I asked how one would do that with a limit of $19K? Apparently by finding an employer that will match crazy amounts. Not realistic for everyone. – And buy the house at the bottom of a previously burst bubble to reap big gains. That’s a lot of assumptions that are pretty shameful for him imo. This is part of the problem I identified in the other thread. So much invective, even passively, thrown at people who prefer to do the opposite of what you want to do. Why do you care if we want to rent? Why do the renters care if you want to own? And yet I see the personal attacks and heightened aggression on both sides here that just doesn’t make sense to me. People should assess their own situation and then do what makes sense to them. Lambasting either side for deciding different than you did in your personal situation won’t help anyone. Yes, there are many non-conforming basement apartments in the city. Whether or not to buy one is all about your tolerance for risk. It’s uncommon for anyone to complain to the city about an established illegal unit but this can happen. I understand neighbors who complain tend to be unhappy about limited street parking. If a complaint is substantiated the city is supposed to make the owner remove anything that separates units and also remove the stove from illegal units. Seattle does allow ADU’s in owner-occupied buildings and seem to be on a slow path toward allowing ADU’s even if the owner doesn’t live on the property. If you plan to live there the risk of renting out an illegal basement apartment seems pretty low. Seattle’s RRIO program requires all rental units to be registered with the city and at least every 5 years all properties need to be inspected for conformance with an ever-changing checklist that is mostly oriented toward occupant safety. I believe it is much more likely for the city to require that an illegal unit be registered than that it be removed. For now anyway, the checklist does not require units to be legal but bedroom egress is required to meet code. If you are looking at a property with an illegal unit you should be very familiar with the RRIO checklist and make sure there is a way to satisfy all the requirements. The term “perma-renters,” as if a person who decides it is not best to buy right now is destined to rent forever. That is a false dichotomy (logical fallacy) I have seen a number of the more bullish posters make, repeatedly. It is possible for both of the following to be true at the same time: a person agrees that over the long run, owning a home is a smart financial decision; and that same person has determined that right now is not the best time for them to buy (within a three-to-five-year window, for example). How is that so hard for some people to digest? Take my wife and I for example. One of our greatest goals is owning a home, but for a whole host of reasons that have been well-documented on this blog, we do not think right now is the best time to buy. We can afford to; we just think the value proposition isn’t currently there. And we have other financial priorities that make more sense to prioritize so long as the value proposition isn’t there, namely paying down student debt, saving healthily for retirement, and accumulating non-retirement cash. Should prices continue to escalate over the next two years? We would then have to re-evaluate considering a range of factors, the same way that we are making that evaluation now and have been over the past few years. RE: FormerSeattleite @ 13 – Yes, some of the property owners on here get angry when one suggests it may not be a good time to buy in the greater Seattle area right now. Haha, I agree. I am not you, but we strive to be in a similar position as you in the long run (based on what I can glean from your posts). We are in our early-30’s/late 20’s, and everything you have stated about the value of building a strong retirement is very consistent with our philosophy. We don’t yet have kids, but we plan to, and we have a long time to build wealth and make good decisions that benefit not only our financial portfolio but also–and more importantly–our family at large. There is no rush, at least not nearly to the degree of urgency asserted by the housing-prices-will-always-go-up crowd. The good thing is that the place had been used as an apartment since the 50’s (at least) and we could document it. It was mainly up to legal code, although it did not have separate meters or a separate “duplex” classification with the city. We fixed it up and made it really nice and gambled that no-one would ever guess that it was not legal. It provided, after a few years, half of the money for our mortgage. Eventually it became legalizable when they legalized MILs under the Accessory Dwelling Unit legislation. Nowadays, it is relatively easy to make an ADU meet the criteria. The only sticking point is usually having an egress window. You can put in an egress window, with, if necessary, a concrete or galvanized surround if it is partly underground. You really don’t want to have to lose sleep over whether the tenant or a neighbor will call you in to SDCI. Make it legal and you will get legal tenants. Make it nice and you will get nice tenants. Exactly my thought. Thanks Deerhawke. Egress makes complete sense. Separate control for heating and a separate breaker box seem like more work, but I have no experience with those. Listings like this are a potential reason I might rent right now, if it makes sense for us to move back to Seattle. Near a million for 990 sq ft, 1, 1, with a blown out attic and basement. In Northgate. At least they have started dropping the price, which gives one hope for sanity returning to the market. Hopefully that means that no one has been stupid enough to bid on that shitshack. Kinda like the difference between a recession and a depression – when your friend can’t afford a house, your town in pricey. When you can’t, something is substantially out of whack, with that house being exhibit A. This is a very complex topic. Just a few points. An MIL is not a “unit we can rent out”. It is for your Mother-In-Law or similarly related non-rent paying family member. A rental unit is an ADU (Accessory Dwelling Unit) unless the property is a qualified Duplex. If it is a qualified Duplex, and in many cases in Seattle the same type of property can be any one of these three, MIL, ADU, qualified Duplex, you can some day leave and rent out both. If it is an ADU, the owner has to live in on site as it is an Accessory Dwelling Unit for the owner to rent as long as the owner is living on premises. The bedroom has the right window is only a very small part of qualifying a portion of a single family residence as an ADU. There are other criteria depending on the City. The bedroom window is to qualify the bedroom as a bedroom whether that bedroom is in a single family house or an MIL or an ADU or a Duplex. This has has more to do with fire code being repeated in other code as the window is about ingress/egress if there is a fire. I have had a client in escrow on a legal duplex set up like a one story with a basement apartment, but County shows it as a “duplex” and it couldn’t appraise because there were no nearby comps for other duplexes in the single family neighborhoods. This being 0 down VA so more stringent appraisal requirements possibly. In any case we switched to a Single family with ADU with the exact same configuration as the duplex, just called by another name, and we could get past appraisal and closing because there were lots of single family comps. Just no Duplex comps. An MIL is what I like to refer to as a “bootleg” rental. That means you can likely rent it out as long as none of the neighbors complain. So if you are planning on buying a house with a rental component, go for the single family with qualified ADU and not merely an MIL. It’s a safer plan. Or go “Pending Feasibility” if the seller will allow that while you check how easy the City will be in granting an ADU for that MIL. Often the neighbors complain due to the number of cars or some other parking related issue. So be sure you have sufficient parking on site for both your family and the bootleg rental dweller AND absolutely be prepared for your plan to go completely sideways at any time should the neighbors not like a rental in their single family home neighborhood. In other words, if you don’t want that house if some time after you own it you can’t use that as a rental, then don’t buy it at all. Stick with purchasing the exact same type of house where the “MIL” is already a qualified ADU. Sometimes the ceiling height is the problem and not a window, as example. It’s not all about a bedroom window. Huge topic with many variables. Just a few notes from my limited experience with these types of properties. Usually in Seattle or Kirkland. Not sure what the other Cities may or may not want as I don’t run into them there as often as I do in Seattle and Kirkland. @Ardell 20 – THANK YOU! I realize it’s much more complex and that is where I am grasping for concrete answers. The realtors I spoke with give answers like – “you call them roommates, I don’t even report the income on my taxes.” And I certainly get the impression that most realtors are simply putting MIL or possible MIL in the listing to cover themselves and because quite frankly most of them are not permitted. These properties are in Seattle city limits. A prior place we looked at had the ceiling height issue. Is there an easy step to take to confirm if it has ADU status? How does one go about checking with the city on getting ADU status? simply a conversation and hope your given the right info or something more? Unfortunately, without the ability to rent these are not properties I would purchase. Re: dariakus, family and funding 401k’s. In Amazon news, Seattle HQ will be transferring thousands of employees from their Worldwide Operations Division locates in the SLU campus to their new Bellevue campus beginning this month and completed by 2023. Corporate needs to make room for an expanding AWS division. Will this be a slow and continued exodus by the company that has soured on Seattle? Let’s hope! You have probably seen this, but just in case. You know this house is walking distance to future Sound Transit station. Once completed, one could get to Seattle Tacoma, Everett, Redmond, Issaquah in min. It is a super location. So just post under a different name like Smardell Bellalogia. No one will know. RE: LuLu @ 24 – for transportation that will be outdated by the time they finish it. Winning! I’m usually the first to get plenty of credit for location close to transit, Lulu. I am ancient, and never had a car commute in my life. But a million for less than 1000 ft of real sq. footage? That’s at least 200K too high. There are a lot of negatives to living above a mall as well. Even a nice mall. And northgate ain’t nice. Now that proximate to roosevelt station, I might be more interested. 3) make enough money in your business to fund it. RE: QA Observer @ 22 – Dear Gawd. Let the crash happen before the 20 something tech bro/frat bro’s invade Blah-view. They will HATE it here. That’s not the department that is moving. RE: Matt P @ 31 – With the average age of early to mid 30s, and the average length of employment 1-2 years, who would these stable Amazonians be that would inhabit the Disneyesque, residential enclaves of the Eastside? Who will sip cocktails at the W, or dine at The Dolar Shop? Who will turn their lights off at 10pm , as the Disney crew comes out at night to make the streets sparkle, trim the hedges and shine the trashcans for the next day? The tale of the 2 companies here: (spoken from an engineer that has worked at both and is under 30) If you stay at Amazon longer than 2 years, you are marked as a bad team player, as you have had to have become cut throat, and lust for blood to survive in the Big Brother atmosphere. If you survive at Microsoft over 2 years, you become known as complacent, with the “Eh, it’s good enough” shrug. Also ignores opportunity cost of investing the down payment. RE: Matt P @ 31 – Just moving their jobs 10 miles. Most likely head back to the belly of the beast in the evening. First time poster here, but have enjoyed the discussions and insights for some time now. Question for the group: With the new HALA legislation passing, our neighborhood is being upzoned to an LR3 designation. We’ve been approached by several brokers/developers who are offering “better than market price,” and I’m wondering how to value our rezoned land value. There seems to be quite a large range according to comparable sales which is not always close to the taxable land values. Can someone give me an idea of how we might go about figuring out a reasonable price range? Ardell and Deerhawke can chime in, but I seem to recall the standard was somewhere between 1/4 and 1/3 of the final product value. So if you could put 4 townhouses that would sell for 750k/each, you might get 750k-1 million for the lot. Would love to get Ardelle’s and/or Deerhawk’s insights. RE: sfrz @ 32 – It’s the global ops team, not AWS. I would even add that it isn’t a particularly slow path. It appears like that it will be a state law that ADU do not need to be owner occupied in cities over 100k people assuming SB 5812 – 2019-20 passes which it has already passed the Senate and is looking likely to pass the house shortly. We should know more by the end of the month about this. I don’t read Financial Samurai but in response to the question about how one could contribute $58k to their 401K “with a limit of $19K”, the answer is that the $19k is not the limit of what you can contribute to your 401K. It is the limit to the amount of income that you can defer from your taxable income. You can contribute beyond this (see “after tax contributions” at https://www.irs.gov/retirement-plans/plan-participant-employee/retirement-topics-contributions ) if your employer allows it – which many do I believe – but the value of doing so seems to be limited unless you take other actions. I believe that the major benefit to the after tax contributions only comes if/when you convert the after tax contributions to Roth… either by rolling them into a Roth IRA (either when you change employers or if your employer allows distributions of after-tax contributions) or making a Roth conversion if your 401K plan allows it. These options incur a tax hit at the time you convert the funds to Roth, though, as the earnings on them get converted at the time of conversion and you get taxed on the earnings… as income I believe and not just capital gains. Check with a tax specialist/lawyer before taking any action, as I’m just some guy on an internet forum! Most of these are done off market and Deerhawke likely knows more on this than I do for that reason. But I’m pretty sure I can share this one via a link since not on market should = not subject to my normal mls restrictions. I was getting offers on this one for years and I think the offers started at $450,000. I can’t pinpoint what year that was but I know the offers had risen to $725,000 by March of 2016. It sold…I would say at absolute peak price last May 2018 for a million for only 4,400 sf. For some reason the link says $100,000. but I know it was a million. The 3X lot rule I use is for one house off; one house on. One house to townhomes needs more allowance for cost of subdividing, sewer and water pipes etc. So maybe Deerhawke at some point pinned that at 4X lot, but the two I was involved in from the seller side still pretty much went for the 3X lot. Though I freely admit the sellers likely made out better than the buyers on those. I knew the sellers, not the buyers. I think they were planning on 4 townhomes on that linked lot, but it was I think long before the 2016 offer that I walked it and knew that, so that could have changed by the time it sold last year. You might be able to find the permits on it or maybe walk by it and see what’s going on there if it’s started. Until 2013, I was the head of multi-family development (row-houses, townhouses,etc) at a large-ish spec develop/build company. I left and since then focused on smaller multi family projects and now exclusively on single family. The safe place for a developer/builder to be is where his pro-forma says he is making a 15% margin — or more. Generally this means the land represents no more than about 25% for multi family and 30% for single family. But you get a lot of crazy people attracted to this business and they bid things up. I have seen multi family developers pay 1/3 or even 35% for the land. They overpay for the land, use easy but expensive financing, then find problems in the build (oil tank, bad dirt, litigious neighbors, etc) and bring on a lot of people. All is well while the market is surging ahead to bail them out (see 2012 to Q1 2018). But they forget that costs can go up while prices of finished product goes down or flattens out (see Q2 2018 to present). This is when they get a lesson. Having to take a check to escrow to sell a property is no fun at all. This is not really your problem, but it does change the environment you are working in. The very best time to sell land was Q1 of 2018. At that point, there were a lot of fools and limited supply of land. Now, there are fewer fools in the marketplace and more supply because of the up-zones. And in addition, the city is extracting a price for those upzones in the way of an affordable housing tax. Other factors that affect the value of your property is the amount of frontage you have on the street, whether or not you have an alley, and whether or not you have sewer and water in front of your property. If the developer finds that the city is going to require a sewer and/or storm main extension (something that is happening a lot these days) then your property is far less valuable than a similar lot in the same neighborhood that does not require these $1000/linear foot extensions. You should know that most of the properties that are sold for development have houses that are small and in poor to terrible condition. If your house is reasonably large and in good condition, you may find that selling to a developer does not pencil for you. You are getting letters from real estate agents asking you to sell. Get each one to give you a ballpark figure. Keep all the letters you get in a file somewhere. When the market heats up again (and it will) and you feel that builder/developers are feeling aggressive, test the waters again. If you are ready to sell, conduct an auction among them. The Senate passed SB 5812 with an amendment exempting cities that already have ADU regulations. So unless that line goes away Seattle won’t be impacted. Even so it seems there is a good chance the requirement for the owner to live in one of the units will go away here in the next few years. But with all the people who are ready to challenge these issues in court nothing is certain. I think (and hope) those answers came from the Listing Agents, as their job is to sell you that and make up crap like that. Hopefully they were not your agents saying things like that. When you go to any City to get an approval for X they can impose upgrades to Code for Y. On the one I am saying said ADU but it wasn’t, the MIL could in fact qualify as an ADU EXCEPT there were other issues unrelated to the MIL to ADU that the City would require be changed in order to grant the ADU permit. Things like that get lost in the shuffle if you only look at the property from an ADU perspective. In the one I did the buyer was a lawyer…so big boy can handle it if and when he needs to. He was fully aware of what else I thought he would need to change if he wanted to have it fully qualified as an ADU before he made the offer. Since he was actually needing the MIL for his MIL (imagine that), it was a non issue at present that the seller side was skirting the issue as to the ADU claims. The location is HUGELY important as to the odds on the gamble and for the one I did it was one or two streets in from a major arterial where it is more likely to get multi-family or townhome approval, even when not zoned for it. Comment #37 is a great value add to the conversation, but I still think you would be hard pressed to try to pull it off for a house that doesn’t follow the spirit and logic of the process. So it is a bit “case by case” as to the odds being 80% vs 30% likely to be approved, even if that change passes. I think there were about 320 Qualified ADU homes sold in the last year in Seattle, so shouldn’t be too hard to find one or an MIL near those who were able to get the ADU status. If NO townhomes or ADU’s are anywhere near that house…and they are ALL bootleg rentals…hmmmm. Not a safe enough bet. Don’t try to do this too deep into a pricey neighborhood and stick with the 3 streets or less in from a major arterial. Even then it depends where in Seattle, but a safer bet if you can’t fall in love with a real ADU setup. Do we do things to click our heels to the KGB politically correct village idiots? We’ve gotten used to unskilled and inexperienced destroying manufacturing in Seattle because they [small minority] think its righteous to turn manufacturing over to China? Would any of you Bubbleheads fly a NWO MAX 8 now? I wouldn’t. Real Estate the same conundrum…if you’re buying in on 30%+ of your left over net pay…you’re paying way too much and sacrificing retirement for a mortgage noose, IMO…I don’t care what the maximum home/rent mortgage debt allows, its a complete joke IMO. To each your own too….smash your head on the real estate cement wall in Seattle if ya like, but don’t go crying back to SWE if ya lose your shirts too. Ardell you work hard to understand a mixed up bureaucratic mess and I appreciate your efforts.. Were the ones buying in after 2008 and expecting a decent return, unless you’re a savvy investor like Erik. Most of us aren’t. How many Seattle home buying folks in your neighborhood bought in in 2008? Less than 1% of the neighborhood perhaps? How about this assumption IMO, kenmorem was a lucky devil [I was too] but won’t detail it clearly [I will]? One person wins the lottery doesn’t automatically mean we all can, think about it. Most draw losing tickets. Follow all of Ardell’s codes and policies or find out your home is unable to be listed without legal “rework” compliance. I spent $1500 on a dish washer not to get the premium stainless steel ones, but spent $1100 on water source to HOA codes. It can be easily detected as non-compliant in a home inspection, especially without the surge protection plumbing improvements. The later sales risks aren’t worth it and you can be sued if its discovered after you sell it non-compliant. my point here was to play up on the despair presented in the previous blog post. basically that housing costs should be magically cut so that everyone could afford “their basic human right” to buying a house. for you and others that have done the analysis to rent vs own and are investing the delta in other productive avenues, i’m all for you and applaud that effort. you will come out ahead of the victim-mentality permarenters that think the world is unfair and everyone should be able to own a house at 1600 pennsylvania. he gets the 59 K by using 401k and post tax 401k, which gets rolled over into a ROTH It is not “normal” but you see it used a lot by folks who are higher earners for various reasons. The Wallingford one I posted did exactly that. It went on for years from $450,000 up to a Million. It was excruciating to watch and be somewhat a part of…but it definitely worked for that seller. Thank you SWE. I would have loved to come to the Toastmaster’s speech you invited us to…but Kent. :) If you ever do one of those visitor or competition speeches at an Eastside Club let me know. Even Seattle maybe. I first joined Toastmasters back in the days when there were only men there. I’m thinking maybe 1974. I was a Bank Officer before many women could hold that position, so most of the meetings I attended on anything were me and the guys. :) I have been a member in a primarily MS group in Bellevue and one in Kirkland, but quit when my friend was no longer running it. She was actually Sargeant at Arms, but to me that’s the person who “runs it”. Keeps it going smoothly week to week or month to month. I don’t get to Kent often…almost never. I think this is big news. I’m curious how many employees they plan to transfer to Bellevue and how big impact this will have on RE prices in this area. I assume quite significant based on what happened in Seattle over the past few years. I tweeted about this in August of 2018. Why are people acting like this is new news? I’d guess no net effect except for realtors. Some already live on the East, some will stay in Seattle. Some will replace them in Seattle and some will move east. I’ve been following SeattleBubble quite regularly for about a year and this is the first time I see it. If someone mentioned it earlier I must have missed it. Do you think this will be a big driver in RE prices on the eastside in the next few years even if there is a recession? Amazon – It’s news because Amazon sent an email to it’s employees that got out. Your right, not news that they leased the buildings prior but news they are doing mass moves of thousands of employees from SLU to Bellevue (read into it how you like whether it’s to clear space for the growing AWS space and current posted roles or something else). @Ardell 43 — Thank you, very helpful. It’s water under the bridge but no, it was not a listing agent. I’m not under contract with the agent as a buyers agent but they were showing the property to me and speaking to me as a potential buyer. It’s worded slightly differently, but this was slated when they took over the Expedia building back in August stating that Bellevue was more business friendly than Seattle. So the handwriting was on the wall since the big “Seattle Council hates Amazon” war followed by the Expedia building takeover. I emailed all of my Bellevue clients at that time. It will be somewhat the same as when Google came to Kirkland and Fremont. The deck gets reshuffled such that ho hum areas swing into more favor than they ever were in the past. It should impact the weakest neighborhoods more than the ones that were already the strongest. Same as Kirkland after Google and to some extent Ballard after Google. Yes…it smooths out the bumps the same way that Microsoft did back in the late eighties-early nineties when the rest of the Country went on a roller coaster ride and Seattle, or at least The Eastside did not. There was an equal upwind to counter-balance the downwind and that came out as basically flat to small % up. You don’t need to sign a contract in this State as the Default Position in the WA Agency Law is that anyone talking to you has to act as your buyer’s agent unless they are THE individual who is also the seller’s agent. Unfortunately most agents and even Brokerages don’t understand what that means. :) Anyone who doesn’t “get” that won’t automatically get better if you sign a contract. Smart move to cluster around the new light rail station. Sure does start to look like a campus. It also looks like a rude hand gesture to the Seattle City Council and to Jenny Durkin. You might be right but I would love to get to the bottom of this. I called one of the bill sponsors and what they told me was that the owner occupancy requirement as currently written would be removed from cities with 100,000 people or more in it. Do you have text from the bill that say otherwise? RE: Realistic @ 53 – My realtor forwarded me similar news several months ago. It definitely created some buyer urgency. But I don’t know how many of these 4500 people already owned home. With light rail connecting seattle and east, I am not sure if it is necessary to move to more costly eastside. So I doubt this news is big enough to entice the buyer to pull a trigger. I am certainly sure it is quite soothing to homeowners of eastside. This type of RE buyer urgency bomb is like that what you read about some big headline news about a public company. Do you pull your trigger in stock market every single time you read such news? For example, recently, every few days and a boeing 737 max related news come up, do you need to take action about Boeing stock? Who knows who is writing those news with sensational headlines, maybe just a twenty something recent college undergraduate whose job is to create eye-catching headline news every week. Do you make big financial decision based on such headline news report whose author bear no responsibility whatsoever to your own wellbeing? Although Seattle has population of more than 100,000 it already has ADU regulations so it wouldn’t be subject to the requirements of this bill as currently written. I should have clarified. I did not send it to induce a buying frenzy and did not send it to any would be buyers. I sent it to my clients who already bought nearby as a “good news” kind of email. I’m not a carpetbagger type agent. I think that this passing will make it even harder to get an ADU approved. The purpose of granting an ADU is NOT to make it a Duplex. If both can be rented…skip the ADU process and go straight to qualifying Duplex. As written, this is not a good piece of legislation. It will make the situation worse, not better. According to the person who answers phones for the bill sponsor their understanding is that the owner occupancy requirement would be removed for cities over 100k and other sections would not apply to cities with existing ADU regulations. I’m awaiting a call back from them to get further clarification. I agree it is confusing. This comment make little sense, you can’t just build a duplex where a single family home is but you can typically add a(n) (D)ADU. Very little land is zoned as a duplex where it makes the slightest bit of economic sense to build a duplex there now. That is the land that typically townhomes or rowhomes or occasionally apartment buildings are built on. The purpose of this IS to make them functionally duplexes that look like single family homes to help increase rental housing supply. I think that this bill, while not perfect is a strong step forward. Well, I don’t see that’s how the bill is written but could be I’m missing something or maybe another revision is in the works. I hope the final bill will be as you have been told. Good for you to be communicating with the legislature! Thanks for the great advice and info. If I was the owner of that property you linked to, Ardelle, I’d sell for $1M too! Since our land is now upzoned to LR3, which I think can be as much as 5 stories, it may be a good idea to coordinate with our neighbors so as to offer a large enough plot of land to build that high. Any suggestions on the best ways to do that? Is a legal agreement or something more casual a better approach? I understand the purpose, but the end result will be a mess. Duplexes are only allowed in certain areas, while ADU’s can be most anywhere. There will be a change in the number of ADU’s being granted to prevent functional duplexes in good, single family home locations. It will end up backfiring. It’s easy enough for them to change the parameters for an ADU to prevent all of these functional duplexes springing up in neighborhoods that don’t want that type of housing in their neighborhood. It is my understanding that Amazon is not just expanding in Bellevue, but relocating an important division there from Seattle . It is also confirmation that Amazon has not given up on the Puget Sound area entirely, but is having second thoughts about continuing to expand in Seattle after the last two million square feet they previously have planned is implemented. If Bellevue adopts a different attitude to Amazon than Seattle as it presently appears – Amazon may continue to expand on the east side. And as they say – a rising tide raises all boats – so an expanded Amazon presence in Bellevue will help real estate in the entire Puget Sound area. ADUs have been proposed in our town. Of course it is a back door way to increase density. The arguments in favor of ADUs that have been promoted that it is a way for seniors to remain in the community by moving into an ADU, which would help relieve the financial pressures of living in this area. Seniors want to remain in their houses – not become developers and landlords. Perhaps if real estate taxes and utilities such as water and sewer were brought under control – seniors could better afford to remain in their residences. Start Your Own Business and Fund You’re Own Retirement? LOL, my best friend has a profitable business and inadequate retirement funds. He bought real estate on an Indian reservation 75 year lease land deal, and the lease has about 30 years left….his wife spent her life savings to build another small house on the reservation land to be rented out later for retirement….he depends on his wife’s medical insurance and she’s another working woman that developed heart perturbation [common now among working women says the AHA]…drugs don’t work on it either….he can’t raise his company rates for 20 years now too, no COLA. The State/County attacks him with endless law suits for huge amounts of back taxes they invent along the way, etc,etc..
My point is, your life is not all smiles and good luck…we all have problems too…some lead to foreclosures too…nope, a stable pension with health insurance is irreplaceable in my book. It all hinges on luck and health. We clearly have a philosophical difference on this issue so there will be no agreement. I think adding ADU to every home would be excellent (obviously this is hyperbole and not actually going to happen). I genuinely don’t care about “neighborhoods that don’t want that type of housing in their neighborhood”. That is NIMBY BS and adding ADU are much less “damaging” than rezoning the whole area so they just turn into a flood of townhomes. Seattle is growing and we need more options to accommodate the newcomers. Sterile MegaCorp Apartment life is not for everybody and having other options available is excellent. They’re just shuffling the seats around on the Titanic…$13/hr warehouse slave jobs are our only hope? RE: ess @ 75 – LOL. Dude, you are tireless with this Amazon spin. Stay tuned for more from ess, Puget Sound real estate’s premier Hype-Man. RE: Justsomedude12 @ 80 – LOLZ! What kills me about these Amazon boosters is that, contrary to their griping about a hostile local government, Seattle’s policitian’s handed Amazon the keys to the city years ago, costs to citizens be damned. A modest progressive tax was proposed to allevaite a homeless crisis Amazon is responsible for, and they folded to Amazon almost immediately, with the Mayor negotiating on their behalf! What’s that you say? Amazon is forced to engage with the democratic process by dealing with elected officials and pissed-off citizens, and that’s just not fair because it makes Bozo grumpy? I say take a hard look in the mirror and ask yourself if you really want to live in a place run by a billionaire-autocrat. It’s also ironic most of these people hate Trump (I am not a fan either), but laud Bozo. They are in the same club, and you ain’t in it. Wake the hell up! Other options…in the right places. Owners of homes are entitled to be able to rely on zoning to support their investment. That’s what zoning is for. That is the purpose of zoning. The compromise was ADU anywhere IF the owner lives on premises to keep things in order and under control. No…you can’t turn that into both being rentals and still call it an ADU. Both rented = duplex. Yes…but still old news. That handwriting went up on the wall when they were demonized. Anyone who didn’t expect this had blinders on. RE: ess @ 75 – even if Amazon’s plan pan out. It only means the money move from one part of Puget sound(seattle) to other part (Bellevue). One goes up and one goes down, it is not like the whole region in average will go up at the same time. If Seattle market goes down, there maybe more buying opportunities there, with light rail in place, I don’t mind moving to Seattle. That one is kind of hard to spin as a positive, isn’t it? But likely some hypester will try. Anyway, Austin was at the top of my HQ2 list. It’s the premier 2nd-tier tech location, more so than Seattle. Agreed that people should rely on the zoning but with one proviso. The zoning conforms to the comprehensive plan. Unfortunately, most people react when their area is being rezoned. It is usually too late to do anything when a developer wishes to rezone a property to conform to the plan. Not that I am a conspiracy theorist, but I believe that local governments keep that information quiet, because they know if people organize during the scheduled comprehensive plan review, politicians, who primary focus is keeping their jobs, will cave to those concerns. Thus those individuals who are concerned about maintaining the character of their neighborhood need to not only educate themselves on how the process operates, but to organize with like minded individuals and take action early in the process before it is too late. To a certain extent. 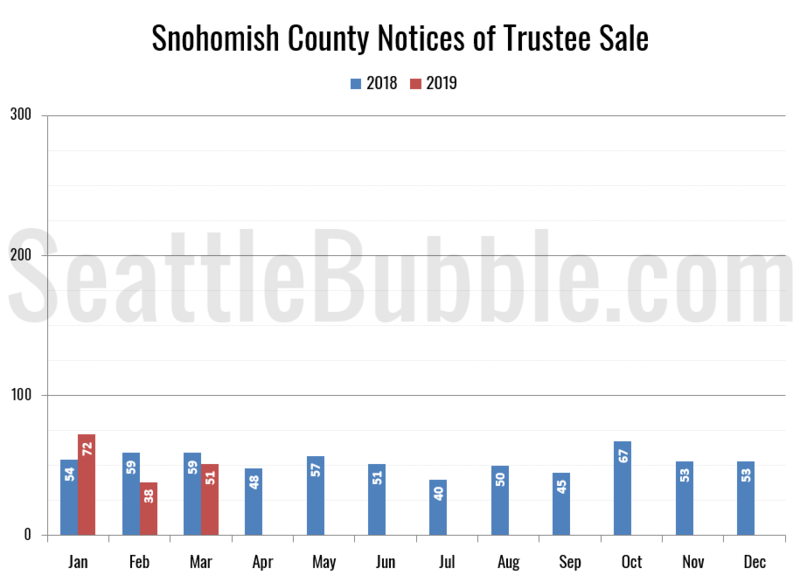 We have property up in Snohomish county, and the prices here have directly been affected by the real estate market in Seattle. If land use statutes and local comprehensive plans limit the amount of buildable lots – it will continue to affect the price of land, and thus housing in the entire area. The fact that governments on all levels increase the cost of doing business with excessive regulation, and that labor and material costs are skyrocketing is just icing on the expensive cake. Apartments are getting any cheaper to construct, and who wants to live in a 500 -800 sq foot apartment for the rest of their lives. Whether governments like it or not – a single family house is still the gold standard for most individuals, especially families. Furthermore – much depends on growth in the area. If growth increases over time – then the Seattle market will not be impacted that some Amazon workers will relocate to Bellevue. Besides – by the time Amazon makes these moves – there will be light rail service from Seattle to Bellevue, and commuting from Seattle neighborhoods served by light rail to Amazon in Bellevue should be relatively painless. And many people just enjoy residing in Seattle – even after viewing the television special “Is Seattle Dying” . The real issue at present that could impact the real estate market right now is not Amazon – which is staying here with a combination of Seattle and Bellevue, but Boeing. They really screwed up with the Max – adding on rather than designing a new airplane. If the public loses faith in that plane – there could be some real serious layoffs in the Puget Sound area, and that would hurt real estate. Considering companies moving out of the area, they estimate Bellevue will have a net gain of 2,500 new jobs between now and 2023. Meanwhile, Expedia is moving their campus to Seattle. It will definitely worsen traffic across the bridge for people who decide to stay where they are and commute. RE: ess @ 87 – Let’s see if Boeing survives this one. The lawsuits are mounting. Ralph Nader’s grand niece was aboard the Ethiopian crash. “A diligent safety anlysis would have predicted this outcome. Neither Boeing nor the FAA seems to have done such after the first 737 MAX crashed. They provided an Airworthiness Directive with procedures that were insufficiant to correct the system induce misbehavior. “It’s like a Tasmanian devil in there,” says Dennis Tajer, a 737 pilot and communications chair for Allied Pilots Association, which represents American Airlines’ pilots. I always wondered why the engine cowlings on 737s were flat. Turns out that the original 737 models were developed at a time where egress to and from the airplane had to be lower for airports to accommodate them. Thus the 737 cowlings were flattened in order to allow the clearance to take off and land. This Max product is basically a 55 plus year airplane with so many add ons that it changed the flight characteristics of the plane to such an extent that they had to add different systems to allow the plane to fly. And those systems are screwed up. The rush to compete with the Airbus Neo resulted in Boeing not developing a brand new plane. And now Boeing employees, as well as the real estate market in this area is at risk because of a major leadership failure that goes to the very top of the Boeing hierarchy. I think Boeing will survive, because they have other excellent products – but if confidence in these planes isn’t reinstated and the flying public avoids these planes, there will be a major pullback in the size and scope of Boeing. Thanks for posting – as the article says – the fact that the jobs remain in the area is the important thing. And adding up all the job openings and new planned jobs, it appears that the tech industry will continue to remain robust in the Puget Sound area. Are you suggesting Seattle is a tier 2 tech city? It has 2 of the 4 biggest tech companies in the world here (the 4 biggest companies period actually by market cap). It is definitely tier 1 along with Silicon Valley. RE: ess @ 90 – I know I’m not getting on one. I also know a retired Boeing engineer that told her son not to fly on one. (he lives in Denver). I agreed with “Owners of homes are entitled” but you lost me with the “to be able to rely on zoning to support their investment”. By that logic if an investment unexpectedly goes down due to zoning changes that means that when a property owner is upzoned and now worth significantly more than before the owner shouldn’t get that benefit. You can’t have it both ways that property owners get huge upside but need subsidized governmentally protected downside. What do we think property owners are? Banks?! The price shift was led by an 8.2% annual decline in the city of Seattle. Prices were virtually flat in West Seattle and declined in every other neighborhood, led by year-over-year prices dips of 14.5% in Queen Anne-Magnolia, 10.6% in Southeast Seattle and 8.5% in the Ballard/Greenwood area.